I’ve gone totally cray-cray for oil based beauty bits over the last couple of years. I get on great with oil based cleansers, facial oils, dry body oils (the Garnier spray holds the record for being the only body moisturiser I ever actually finished) and leave-in hair treatment oils – my hide and mane just happily soak ‘em up. But it had never occurred to me to wash and condition my hair in the stuff – until now. 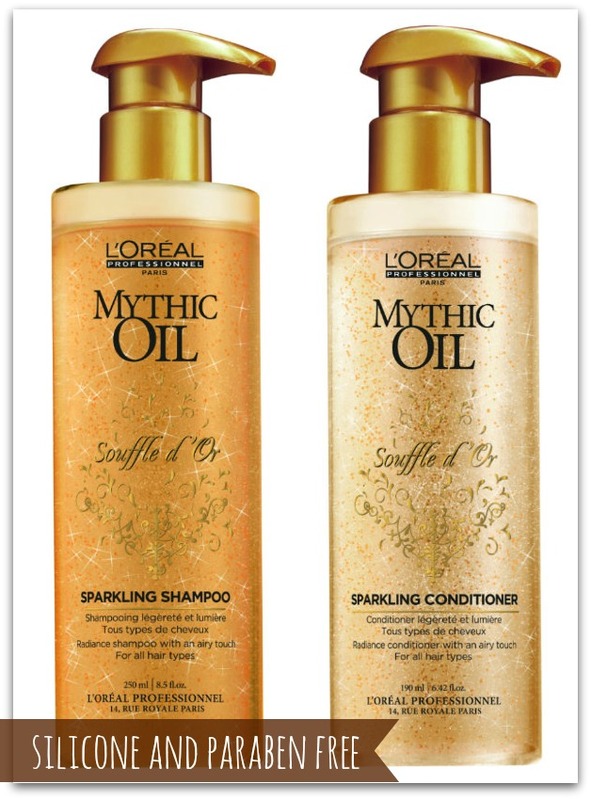 As a fan of the original treatment oils, L’Oreal’s new Mythic Oil Soufflé d’Or shampoo and conditioner piqued my interest straight away. I’m a sucker for a luxe haircare range and these products feel lovely and high-end, from the way they look, all transparent and seductively shimmering (though the gold flecks do strike me as a touch unnecessary, especially as they just wash out), to the way they feel and perform. The key ingredients, argan and safflower oils, don’t weigh down my hair at all, but leave it feeling healthy, shiny and conditioned. Despite my hair being quite thick, dry and damaged, and generally in need of some heavy duty TLC, these quickly whipped it into shape while feeling quite lightweight. I generally follow up with some hair oil and boom! I have silky, swishy locks all day. Both products are paraben and silicone free, which is good because these ingredients do concern a lot of people. I’m not one of them – in fact, my hair loves silicone – but if there are good quality alternatives out there, why not use them? You generally have to spend a little more to avoid them, and that’s also the case here – the shampoo is €16.30 and the conditioner, €17.50 – but then again, these are premium salon products. I'm liking them a lot. Have you tried these and how did you get on? If you fancy giving them a whirl, check out the website to find your nearest stockist. I am sold on the sparkles alone!! I HAVE to try this out as soon as it hits SA! That sounds really good! Had a sample of mythic oil and loved it so can only imagine this would be brilliant! I love hair oils too, I'm using the Caudalie Divine Oil at the moment and it does wonders for my dry ends, would love to try these out! They sound great! I'll have to see if these are here in the States. I'll have to look for this product! Interesting! I must try this one too! My hair gets dry after I got it permed. Hope this can manage. Ooooh... think I might need to give these a try!